Abba was fanning himself with the folded front section of Ma’ariv when the bell buzzed. Ema was making her way through the kitchen door with a transparent tumbler of tea and nana, held on a waxy serviette, stirring up settled sugar. Abba looked up at her. Ema reached the couch, placed the serviette on the glass top of the coffee table, gently settled her tumbler on the serviette, and seated herself, with dignity, on the settee. She picked up the weekend supplement and considered the table of contents. The doorbell, whose chime had long since deteriorated into a scratchy drone, sounded again, much longer. Abba, whose gazed had tracked his wife along her journey from kitchen to sofa, stared at the straight-backed figure in the white satin housecoat he had bought her on their trip two years ago to Bonn. Ema turned a page. A drop of sweat crawled from the corner of his right eye to his cheek. He turned his gaze to me, sitting on the cool patterned tiles with my Ditza. “Is someone going to get the door?” he asked, directing his words into the high-ceilinged vacuum, the drop of sweat falling from his cheek and just missing the strap of his white singlet to hit a tuft of hairs on his bony shoulder. Ema finished reading a sentence, smiled, and slowly, with poise, directed her eyes at her husband. “Well, you certainly don’t expect the girl to do it,” she said acidly. “No, I certainly don’t expect the girl to do it,” Abba replied, mimicking her voice. “I’m busy,” I announced, and I was, as my doll was demanding my attention and comfort, and to stand up would be to leave the thin layer of temperate air that lined the floor and enter the stifling inversion above it. “I’m not dressed,” Abba said, pulling at the damp stain of undergarment sagging at his sternum. “I wonder,” Ema mused, returning to the article she had begun reading, “who could be calling at noon on a July Saturday, when no decent soul goes outside for the heat. And why haven’t Omri and Nimrod come home yet?” Omri and Nimrod, my fusty teenage brothers, had gone to commit fouls against Arab kids in the Kidron Valley. It was the most audacious place to play football since the war ended and the no-man’s land could serve as a pitch. The buzz sounded insistently. I saw a face peek through the window by the door. “She knows we’re here,” I observed. Abba glared at Ema, pushed himself up from his chair with sinewy forearms, brushed biscuit crumbs off his boxer shorts, and shouted “Daka! Daka!” Marching to the bedroom that opened off the salon, he emerged a few seconds later with a white shirt slung over his shoulder, pulling on the pants of one of his three black suits. He donned the shirt, buttoned it with swift expertise, tucked the tails into his pants, zipped up his fly, buckled his patent-leather belt, and strode toward the door. “You’re barefoot,” Ema said, still reading her article. He glared at her, returned to the bedroom. The doorbell buzzed again and the mattress on the double bed creaked. He emerged fully dressed and headed for the door. When the door opened, we were presented with a woman too old to be a mother wearing a tapered sky-blue suit with a skirt reaching below the knee. Her shoes were stern and proper ones with firm heels and her hair was too-perfectly copper. She had been pressing the bell button with a finger clad in white cotton glove. Ema covered her mouth with both hands, for she knew who this woman was before we even heard the voice speak its English words with a Levantine-tinged British accent. “Yes?” Abba asked, confused, as he had been expecting a neighbor or perhaps the concerned mother of one of the members of the boys’ gang. Abba and Ema reacted as if they saw, behind the visitor, three witches, five wraiths, and a host of goblins. I couldn’t decipher the looks on their faces at the time, but I soon learned that they had been having nightmares about this very scene ever since June 9, when they heard Mordechai Gur, amidst the static of the radio and the racket of war, announce that the Temple Mount was ours. The barriers fell in short order and Jews streamed into the Old City and East Jerusalem and Arabs began, hesitantly at first, walking over to the Israeli side to watch the traffic light at Jaffa and King George and inspect the wares in downtown stores. “I had a piano as well, in the home I had to leave,” Ema said with a politely frozen smile. “You’re letting her in!” Ema gasped. “I promise it will not take long.” The visitor gazed at me. “What a beautiful little girl!” She fumbled in her purse. A small Cadbury bar appeared against the background of her white glove on her left hand, held out to me. I rose and took it. In the doorway, Ema exclaimed: “Karin!” Behind her, Abba was wiping his face with a blue-bordered handkerchief. “Ema calls it the guest room,” I said, taking her hand again and leading her across the corridor. “I’m the only girl in class who has a guest room.” I paused to unwrap the chocolate bar before we passed under the archway. 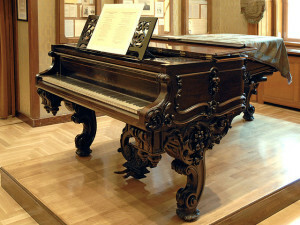 The piano stood in the center of the room. A vase with a single rose stood on a white doily on the top of its polished and closed lid. The visitor stood for a moment and gazed at it, then walked slowly around it, counter-clockwise, ending at the keyboard. She lifted her skirt and sat down. The corners of her mouth turned down when she saw the music above the keys. “Liszt.” She shuddered and looked at Ema. “May I?” she said. Ema was about to say something but Abba cut her off. “We had it tuned just last week,” he said. The visitor played an arpeggio and smiled at the sound. Then she played a few measures of a piece, slow and wistful, and rose. Abba stepped back and held out his arm toward the door. “It’s been a—surprise,” he said. At the door, the visitor held out her right hand and Abba and Ema slowly raised theirs to shake it. “You’ll find my rates quite reasonable,” the visitor said. Then she kneeled down to look me in the eye. “You can call me Miss Violet,” she said. “When will you come back?” I asked. “You must let your parents decide,” Miss Violet beamed at me. “Oh, they do whatever I want,” I said. “You were just leaving?” Ema asked. “It is not a problem,” Miss Violet said. “I have done it before.” And she turned and descended the stairs to the garden. Abba and Ema stood in silence for a moment. I nodded and went back to my doll. 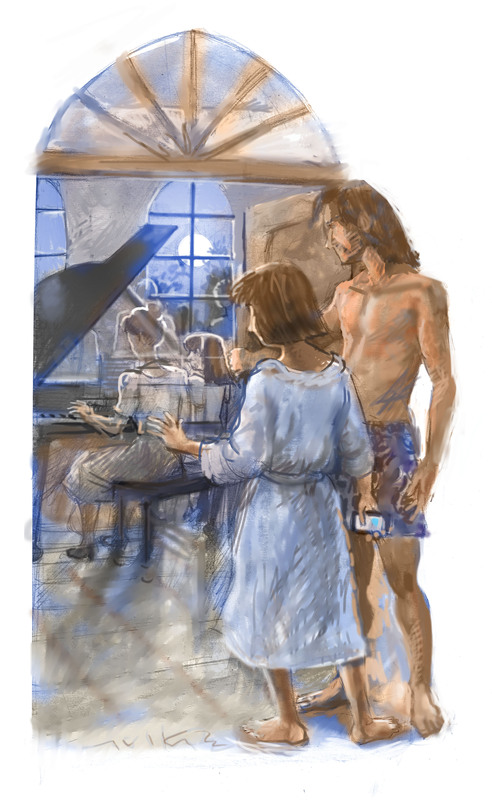 “Did you hear,” she called out to Abba, who was in their room changing, “how she said ‘Lizst?’” There was no reply. She sat down on the couch, caught sight of her glass, sighed, and got up to make more tea. Fiction: In an old Arab house, a piano teacher returns. Lovely, interesting story and so beauutifullywritten!! !